Evin Amir and her family fled the civil war in Syria and came to Germany. Amir gets help from her sister, who’s lived in Germany for some time – but it’s not easy starting from scratch in a foreign country. She’d had enough. Evin Amir loved Syria, and her hometown of Aleppo – but she didn’t want to live in a war zone any more. The Kurdish woman and her husband Shirzad Rasho, a gynecologist, had to take turns going to work, because they didn’t want to leave their young son Alan at home on his own. Sometimes Amir, who worked for a telecommunications company, had to stay in her office all night because the road home was cut off by fighting. “Life was already hard with one child,” she said. Then she found out she was pregnant. “A second child? Completely impossible. We had no electricity, no water; sometimes we didn’t even have milk or bread.” That’s why, in early 2013, the family decided to leave the country and flee to Istanbul. “Syria to Turkey – you can almost walk it,” said Amir’s sister, Nissrin Emir-Dilbar. Emir-Dilbar is a language teacher, and she’s been living in Germany for almost four years now. She initially tried to bring Evin and her family into the country by going the official route – but that didn’t get them anywhere. So in July 2013, Evin and two others got in a car and were driven for four days, right across Europe and over the German border. Her son and husband initially stayed behind in Istanbul. Once in Germany, 34-year-old Amir was taken to a preliminary reception center in Dortmund. Her application for asylum was granted: She was given a three-year residence permit, and moved in with her sister. Then her husband and son were also brought to Germany, and in February this year the family of four – little Alin was born in October 2013 – was finally able to move into a three-room apartment of their own in Bonn. Many of their countrymen are also seeking asylum in Germany after having fled the civil war. Official statistics show that around 31,000 Syrians have applied for asylum since spring 2011. In addition, the federal government decided in 2013 to take in two special contingents from Syria, 10,000 people in total. They were selected according to specific criteria, such as family ties, or the contribution they could make to rebuilding the country after the war. They were not required to apply for asylum, and instead were directly given three-year residence permits. The extent of the humanitarian disaster in Syria has prompted German Foreign Minister Frank-Walter Steinmeier to announce that another 10,000 Syrians will be brought to Germany. The interior ministers of all the federal states will decide on the admissions program at their upcoming conference, on June 13 and 14. According to United Nations figures, around 2.5 million Syrians have fled abroad since 2011, while around 6.5 million are refugees in their own country. Since April, Evin Amir and her husband Shirzad Rasho have been attending integration courses. Six-year-old Alan is in kindergarten, and will start school in August. His aunt explains that the German language is still quite a problem for him. So far Alan has only made one friend – a girl who, like him, speaks Kurdish. When they play together and his playmate’s German friends come to join them, Alan gets very jealous, Emir-Dilbar said. “He says, ‘I haven’t got anyone here and I don’t understand German,’ and then he cries,” she explained. Baby Alin seems happy in her new home. Alin wriggles around while her mother is talking, playing on the black sofa with a musical butterfly. The sofa was given to the family by friends of Emir-Dilbar. Most of the furniture in Amir’s apartment was donated by her sister and her friends, including the dining table with its four chairs, and the adults’ bed. For now, Amir and her husband have been receiving money from the state. Both of them want to learn German and get jobs as quickly as possible. It’s only fairly recently that they’ve been able to concentrate properly on learning the language: Before that, their time had been consumed with looking for somewhere to live, and going back and forth between various administrative departments. Emir-Dilbar always accompanies them. 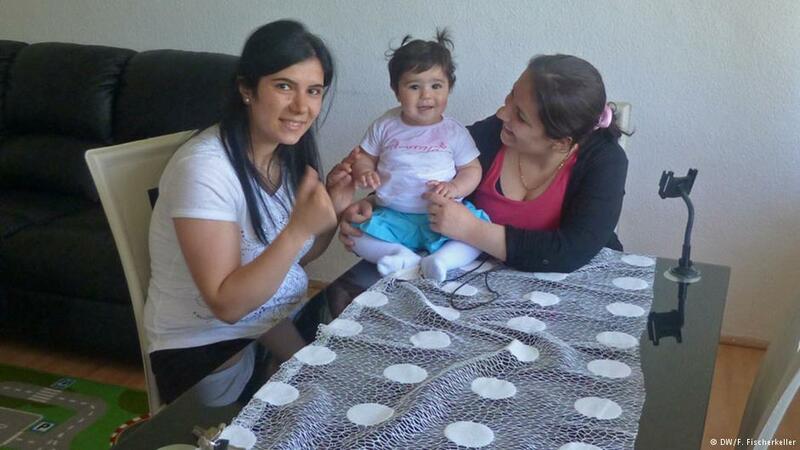 She also helps other Syrian refugees who turn to the Kurdish association for assistance. The 32-year-old volunteers there, helping new arrivals navigate the German bureaucracy. Despite such difficulties, Syrian refugees appreciate the peace in Germany. When he isn’t in the park, Alan plays on a tablet computer. His parents bought it for him in Syria – so that he would be less conscious of the war right outside their front door. When he was watching a cartoon on his tablet, he was transported far away from the bomb blasts and gunfire. Apart from Alan’s tablet, Amir and Rasho were hardly able to bring anything with them from Syria. Their emergency journey, first to Turkey and then to Germany, didn’t allow for sentimentality. They didn’t even bring photos with them to Germany: of the sisters’ father, for example, who was killed in the civil war last August. When asked what she misses most about Syria, Amir doesn’t need her sister to translate. “Everything,” she said, and started crying. She would like to go back to Syria – when everything is back to normal.